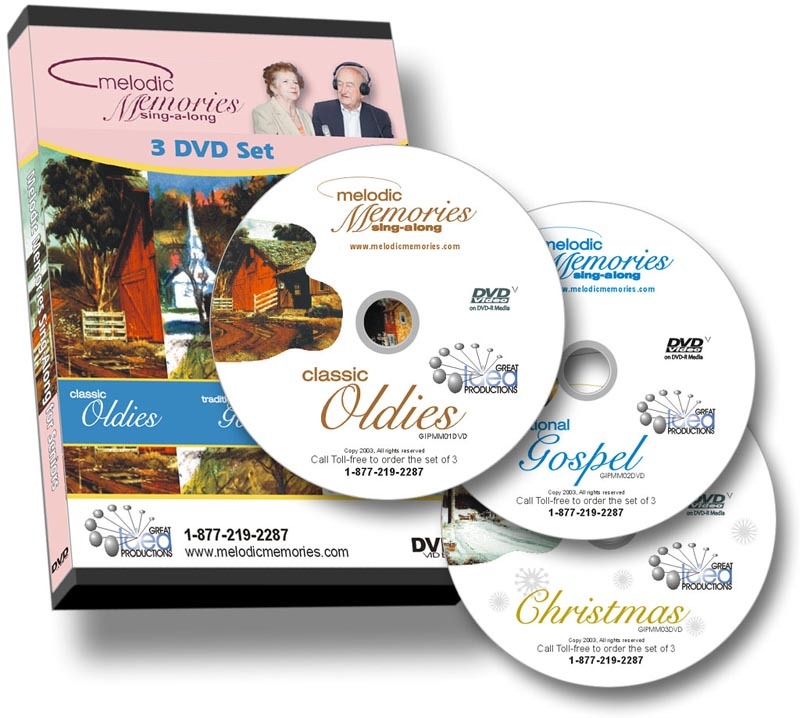 to carry the Melodic Memories – Canada Sing-Along for Seniors at a substantial discount off the retail price of $139.95 (for the Series). AND, if you buy 5 or more of any of the above, we’ll take take a further instant 10% OFF, as well as drop the Shipping & Handling fees. When you increase the quantity of any product to 5 or more you’ll automatically receive a further 10% off and NO SHIPPING & HANDLING! The discounts will be applied upon adding the items to your shopping cart. 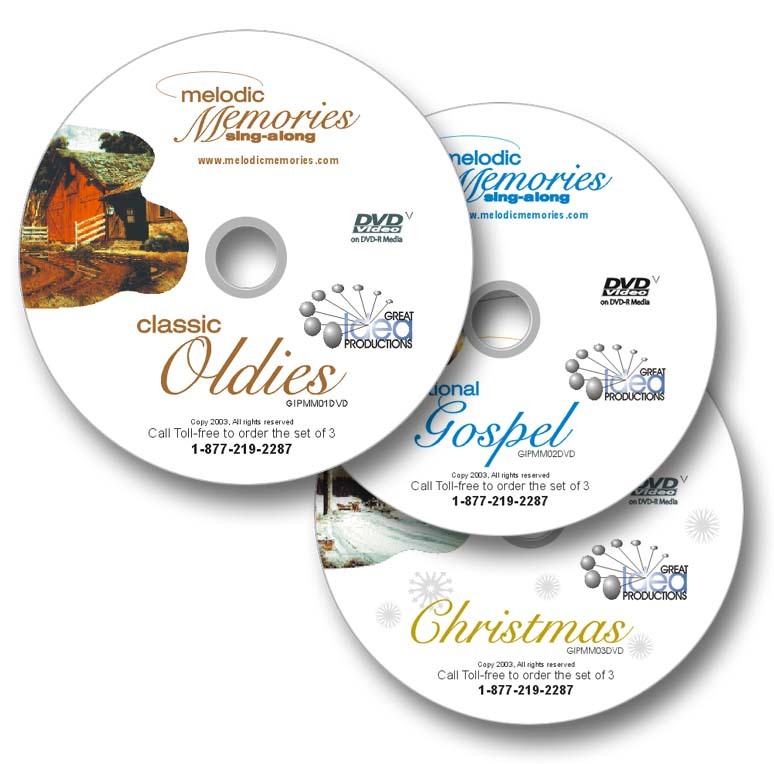 Each DVD video is one hour in length, split into 30-minute sessions, with over 25 classic oldies, traditional gospel or Christmas favorites. A lively audience sings along and the words are clearly displayed in black on white at the bottom. Select the DVD of your choice below. If you want more than one, add the second to your cart and select a different disc from the option drop-down menu. It's cheaper per disc, however, to simply buy the Series, or the Package. 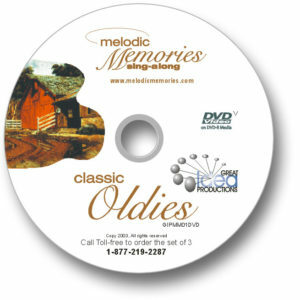 Each video is one hour and is split into 30 minute sessions with classic oldies, gospel and Christmas favorites. A lively audience sings along and the words are clearly displayed in black on white at the bottom of the screen. Added benefits of DVD are the broadcast quality image and the ability to skip directly to any song or chapter instantly. Each video is one hour in length and is split into 30 minute sessions with classic oldies, gospel and Christmas favorites. A lively audience sings along and the words are clearly displayed in black on white at the bottom of the screen. Added benefits of DVD are the broadcast quality image and the ability to skip directly to any song or chapter instantly. THIS FULL PACKAGE includes the Series, as well as one each of the individual discs comes in their own case for those who want to sign out single sing-alongs for any occasion. Have any questions or need further assistance, please CONTACT US.